Paul and Mariana with the 2017 “Sunlight of the Spirit” Award Thomas Yurkovic and Patrick Ward. 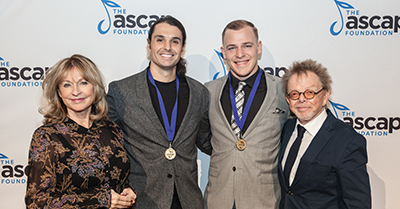 What: The cash award in the amount of $5,000 is presented, to full-time undergraduate or graduate student who is exemplary in recovery (a year of sobriety is required) and in music creativity. Please Note: Awardees’ name will be publicly announced. NOTE: If a submitted work is co-written each writer must meet all criteria and each writer must submit their own application and required materials. In this case, the cash award would be divided evenly between the writers. Julie Lapore, Associate Director, The ASCAP Foundation (Jlapore@ascap.com). All Application Packages Must Be Received No Later Than Friday October 1, 2018.